Having a baby at home means that a lot of environmental conditions must be thought about, but one of the most important is finding the best temperature for baby sleep. They aren’t as resilient as adults and can soon become uncomfortable if they aren’t in the right surroundings. It’s also crucial that they are able to sleep properly, and it’s impossible to do so if they feel too warm or cool. In this article we will be talking about the ideal sleeping conditions for a baby with particular focus on the optimum temperatures and how to achieve them. Babies need to sleep a lot more than adults- up to 18 hours a day when they are newborns. This will happen in one to three hour stints because of their need to regularly feed, which is why you will have interrupted sleep to look after them in the first month or two. This is completely normal, and will start to change after about 2 months when they will sleep for shorter periods during the day, and for longer at night. To start with, babies’ sleep cycles are very different to our own, and they will spend far more time in REM sleep- this is to allow the fast development of the brain, but is a light stage of sleep that is easily interrupted and requires the baby to be in perfect sleeping conditions to work properly. These are all signals that a baby needs some rest, so they should be put in their cot as soon as is feasible. Once they are awake during the day, change their clothes into daytime attire so they begin to understand that it’s the beginning of a new day. Heighten your interactions with them by playing and talking, and when you feed them you should talk or sing to them as much as possible. It’s also helpful to keep the environment bright and cool, and keep them within earshot of normal daytime noises like a radio or vacuum cleaner. Also, if they fall asleep while feeding, you can gently wake them up. At nighttime your behaviors should be a direct contrast to those during the day. Reinforce that it is the end of the day by changing them into nightwear such as pajamas, keep the lights dimmed, stop all extraneous noises and distractions, and try to not speak to them during feeding. If they nod off, then put them back to bed instead of waking them up like you would during the day. After about three months, babies are able to start falling asleep without needing to be put to sleep. This doesn’t mean that it will happen instantaneously, but it’s a behavior that can be encouraged. The important thing to note at this stage is that they will develop habits, so you must be prepared to commit to the routine the same way each time. By putting them down when they are showing signs of being sleepy, but not yet asleep, they will soon drift off. If you want to stay with them until this happens then this is fine, but it will be consistently needed going forward. Similarly, rocking your baby during the first few weeks of their life will mean they become accustomed to this motion, and you may find yourself needing to continue for a number of months until they can sleep without it. At the same time as when a baby is able to fall asleep on their own, it’s a good idea to instill a bedtime routine to reinforce the fact that it is nighttime and the time to go to sleep. This helps them to develop daily rhythms, and will have a significant positive impact on their sleep patterns, and yours. The idea is that their body will become used to a routine, they will learn what comes next and, as a result, be more relaxed and able to sleep. The first step is to choose a regular bedtime for them- let’s say 7 p.m. The pre-bed routine should last for about 20 or 30 minutes and be focused on calming them down. Good activities for this time are things like playing quiet games, having a bath, reading stories or singing lullabies, changing them into pajamas and giving them a soft massage. The routine should end up with you both in the bedroom, and putting them down calmly in their cot to sleep. At this point you should reduce all noise and distraction from around the house such as lighting, phone, and television noise. That way it won’t seem like the baby has been taken from the exciting outside world and put into a quiet room. There’s a wide range of products available that are designed for babies to sleep in, but the most common ones are either cots, cribs, or Moses baskets. These provide the frame, but you will also need a mattress (3 to 4 inches thick in a cot or 2 inches thick for cribs and Moses baskets). It should provide firm support, and will likely be designed in a way to make it wipe clean and very hygienic, but the PVC coating usually used can make the baby feel more clammy in warmer weather. For comfort and temperature regulation, a set of sheets are also needed. You’ll need about three or four, preferably ones that tuck in nicely around the mattress. 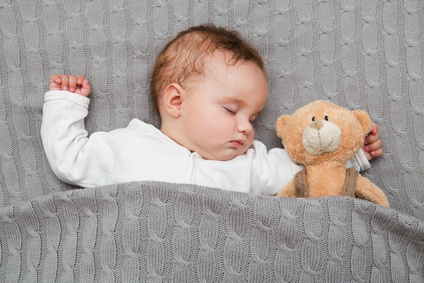 What is the Best Temperature for a Baby to Sleep in? For the first few months, at least, babies should sleep in the same room as you so you are able to respond to their needs during the night. This means you will be sharing the same environment, but it’s important that it’s tailored to the needs of the baby. Temperature is a major factor in allowing babies to sleep comfortably, and the suggested range for the room temperature they sleep in is between 61 and 68 degrees Fahrenheit. This will feel cool to an adult, but it ensures the baby won’t overheat. Ideally this will be maintained consistently throughout the room without relying on radiators or heaters overnight, as they can create hotspots and you won’t be able to monitor the room temperature at all times. There are some smart thermometers you can buy that are designed to help maintain the optimum sleeping temperature for baby if you need some help, which alert you if it is getting too warm or cold for them. At first you should keep checking on your baby and, by feeling the back of their neck, you will soon get an instinct of a good temperature, how it changes, and take action to cool them down or warm them up. As mentioned earlier, you can get a smart thermometer or a baby monitor with an inbuilt thermometer function that will warn you if the room temperature is getting too low or high. Baby sleeping bags are great for use in colder environments and can be unzipped if they are feeling to warm to increase the airflow. Similarly during summer when it’s hot, it’s a good idea to use a few sheets, as you can adapt to the weather by removing or adding them. Baby sleep routines can be one of the toughest aspects to a newborn that parents face- especially at the beginning when they won’t sleep all night long. It’s an important time for them, and it’s understandable that parents worry about maintaining the best conditions for them so they fall asleep as easily as possible. If it’s too warm or cool then you probably won’t be able to get much sleep yourself, so finding the best temperature for baby sleep is vital.